When you think of Halloween candy, you usually think of chocolate bars and lollipops. However, gummy candy shouldn’t be overlooked. Aside from the standard gummy candies, like gummy worms and fish, special Halloween versions are a great way to creep out your friends. Here are a few you should definitely add to your Halloween fun. What’s creepier than gummy body parts? 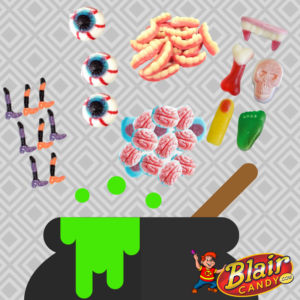 We have plenty of choices for you to choose from, between gummy eyeballs, teeth, and even brains. If you can’t choose, then a bag of mixed body parts, like teeth, bones, skulls, and brains should do the job. Witches are always a go to Halloween theme. These gummy witch stockings are a delicious way to stay on theme. With purple and orange stockings, it will match with your festive color scheme too. If you think insects are the creepiest part of Halloween, then these hairy, gummy spiders should help up the creepy factor. This bag has over 300 of these spiders, each with their own flavor combination, ensuring that there’s plenty for everyone. Don’t forget to try these and other gummy candy treats by visiting BlairCandy.com. Stock up on these and other trick-or-treating favorites today and get prepared to creep your guests out!